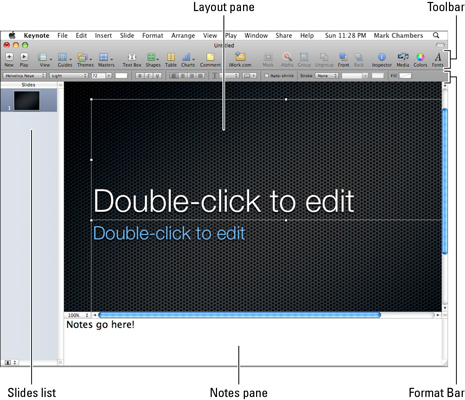 The Keynote window is dominated by the Layout area. The Slide list can also display your project in outline format, allowing you to check all your discussion points. (This is a great way to ferret out any “holes” in your presentation’s flow.) While in outline mode, you can still jump directly to any slide by clicking the slide’s title in the outline. To display the outline, click View→Outline. You can switch back to the default Navigator Slide list by clicking View→Navigator. Toolbar: As does the toolbar in Pages and Numbers, Keynote’s toolbar makes it easy to find the most common controls you’ll use while designing and editing your slides. Clicking an icon in the toolbar performs an action, just as selecting a menu item does. Notes pane: If you decide to add notes to one or more slides (either for your own use or to print as additional information for your audience), click View→Show Presenter Notes to open the Notes pane. This text box appears under the Layout pane. Format Bar: Keynote displays this button strip underneath the Keynote toolbar, allowing you to format selected text, paragraphs and lists on the fly.